Poster for Festival de Sexto Sol, 1970. With the Sexto Sol Conference, the Pocho-Ché poet rebels regrouped with others and launched the first and possibly last attempt at re-figuring La Missión as a Green Center. Alejandro and Roberto had met with Stanford University supporters, Fernando Alegría and Jean Franco, various student organizations headed by MECHA and had agreed to hold the Sexto Sol event at three sites during March 30, 31 and April 1: Stanford, San Francisco State and the Palace of Fine Arts in San Francisco overlooking the Golden Gate Bridge. 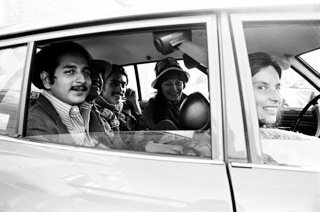 Nina Serrano, Victor Hernandez Cruz, Roberto Vargas, Alejandro Murguia, and a friend, on the the way to Satanford for the Festival Del Sexto Sol. Sexto Sol was a collective occasion of cultural cross-overs and political affirmations. Jazz riffs, dance and salsa music: two folklorico ballet groups, four political teatros, Teatro de Los Mascarones, Los Topos from Mexico City and Teatro Cena and Teatro de La Gente from the Bay Area. Among the critics were Carlos Monsivais--also from Mexico City--and Jean Franco, Fernando Alegría and Arturo Madrid. Some of the Bay Area writers represented were poets such as Avotja, David Henderson, Carol Lee Sanchez, Dorinda Moreno, Natalia Rivas, Alejandro Murguía, Roberto Vargas, Nina Serrano, Victor Hernandez Cruz, Alurista and myself. Enriquetta Vasquez from New Mexico and Ricardo Sanchez from Texas stood up for the heartlands of the Southwest. There were also various music groups such as "Kafala" and "Spice"--sixty in total--inspired the moment. We were armed with a thick set of voices, tropical categories for our word and the prism of Red poetics. Did we have to choose one over the other, would we stray, continue into a more radical form? 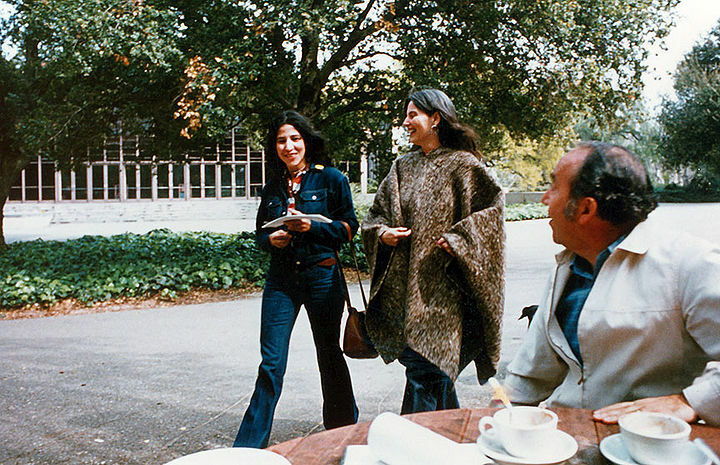 Nina Serrano, middle, and Fernando Alegria, right, at Stanford during Sexto Sol in 1970. 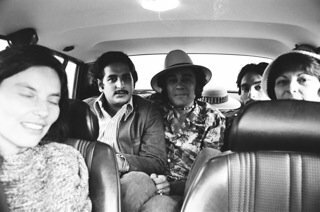 On February 5, 1970, Vargas writes of a visit to the Sexto Sol Conference site--the Palace of Fine Arts that sits by the Marina facing the Golden Gate. ..split home later to Rancho Nica with D/boy Tajadas con chancho reservations for meeting friday with Jean Franco Fernando (Alegría) Nina (Serrano) Gato (Murguía) etc. Conference form Gran Combo echoing thru the pots & pans split to Palace of Fine Arts to check out magic. Stone figures lonely w/each other looking cold. Ducks transfixed. Musty green waters everywhere ruins and reconstruction ruins...I wonder if we are in Egypt /some Nile. The wind prays our faces with "time to split dust" Boy Boy remembers similar ruins. Can this space be resurrected by our conference? Later in the month, on the twenty-fifth, Vargas along with Victor Hernandez-Cruz and Mission photographer, Joe Ramos work on the initial flyers for the event. Vitin (Hernandez-Cruz) Ariel and I split to Art Commission to visualize/flash on flyers for conference. José Ramos is a genius...We split to PO Box Vitin gets pan y salsa in the form of a royalty check -- smiles. Read my poem to him: "Oye poesía Vitin is smiling"..
Vitin Gato & I already showing signs of stress from the organizing weeks behind us. The walls are echoing of Peruvian music. The air is tight Fernando comes in with Arturo Madrid Nina & Daniel (del Solar) follow. Delia (Alegría) arrives with dimples ready. Red wine softens the music I'm still sober but high. Fernando remembers Neruda and Nicanor. Shakes his head about Parra and Facist Regime (Chile). We discuss ceremony and streaking on bicycles candles and empañadas.... Vitin, Nina, Gato, I split to Elia's (Hruska-Cortez) pad. After weeks of meetings phone calls luncheons writings thoughts tears laughter new loves lost loves.. weeks of broken hours mended lives communication lines spidering across Indo America thru pages of Bolivar's quest of Continental unity.. The Sexto Sol was in the hands of the Mission poets, the Tropical vision was expanding, contracting, changing. 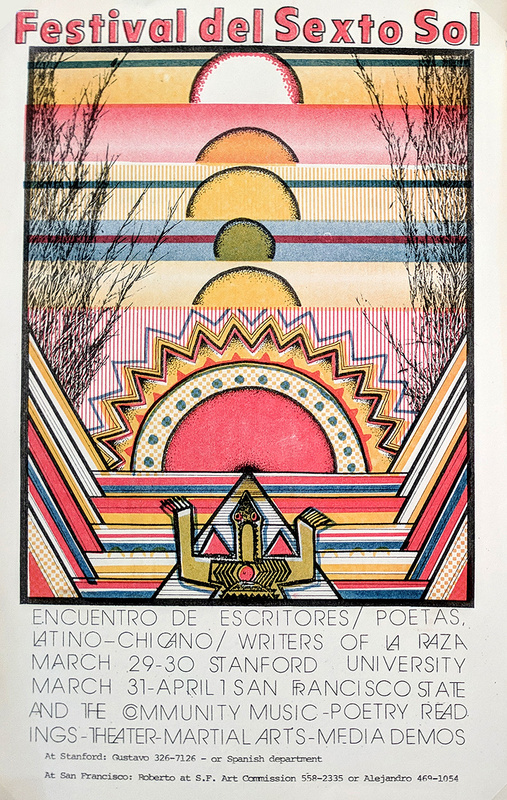 The Latino Mission poets' writing practice flourished in the nexus of urban Santeria, Mexica-Chicano nationalism and a unique Bay Area international Tropicalismo. Murguía and Vargas as lead organizers of the Sexto Sol Festival upheld these notions with the emblem of El Sexto Sol, the Mexica new age of the Sixth Sun. Poets on the outer rings of the Pocho-Ché such as Nina Serrano followed the Sexto Sol call. Her "Sexto Sol" poem published in 1980 in her first book, Heart Songs, the last surge of the Pocho-Che Editions publication project beseeches the new Mexica age to appear. During the Sexto Sol Conference I stayed at Murguía's and Vargas' house, a locale jokingly known as Huehuetitlan, House of the Elders. Mix a bowl of Ceviche, Mexican style-marinated fish, oysters, jalapeños, cheddar cheese squares, onions and crackers and wash it down with orange juice. We would wear pendeltons, bogart hats, khaki pants and a shredded bundle of poems, books and folders under our arms. At night we would hang out at Caesar's Latin Club in North beach on Green Street. Mongo Santamaria played out the early conga slaps recorded in the Treat Street Fantasy Records studio.